While Hitta.se has the working example, the 3DMaps EX software powering it is by Agency9, which in turn uses technology by C3 Technologies, a subsidiary of Saab, the Scandinavian military technology giant. The technology is based on high-resolution aerial photography with carefully calibrated cameras. For every picture, the camera’s position and angle are calculated with extremely high precision, using a very advanced navigation system. This is what enables us to give each pixel its geographical position with decimetre accuracy. Then, using stereovision technology, we combine two sequential pictures to measure the area’s height profile. The result is an aerial photograph with each pixel positioned in three dimensions. Over an entire city, thousands of such photos are combined into one coherent 3D model — through an automated process in our unique 3D-processor. Thanks to all this, there is no one today who can take pictures with the same precision and speed as we can. One example is when we filmed all of Stockholm in October 2007 and created a realistic, yet zoomable and turnable, 3D model of the city in just 3 days. 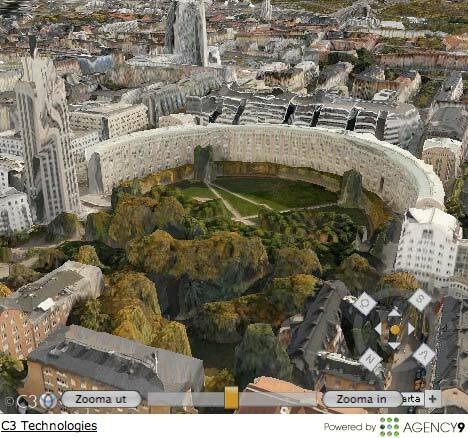 Google Earth’s 3D city models are built by traditional means. Because the used images are flat, Google Earth often misses out on displaying heights for buildings and trees. Hitta.se’s technology is completely automated. Any object larger than a VW bus is included in 3D in the final image. Google Earth has a limited numbers of buildings in each city. Hitta.se will show all the buildings in a city automatically. Unfortunately my Swedish isn’t good enough to know what the pop up is telling me to do before I can go to the 3D map, and I would be very grateful if someone could provide a translation to English, plus any other tips on getting into the map. click on the check box, then click on the button with “Till 3D kartan” on it. I think its a cool application, but I’m not much of a fan of how it renders the city. It reminds me of a painted sandbox. Don’t get me wrong, its a very cool means to show Stockholm, but I was hoping for more sharpness in the way the buildings were drawn.